Well at this point I thought that I would provide an update to things. I am now down to just 1 gold striped and 2 copper striped cardinalfish. Also I have added in 5 astrea snails and an emerald crab (which I have not seen since I put him in the tank. The 4 small snails are still there doing fine along with the shrimp. The mangroves are still growing a little, but not much. 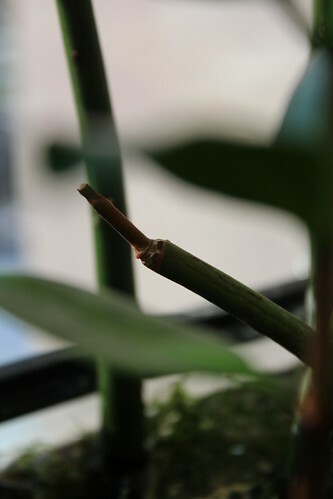 The one that I broke the top off of seems to be budding out a new stalk, but I will have to wait and see if that happens (fingers crossed). 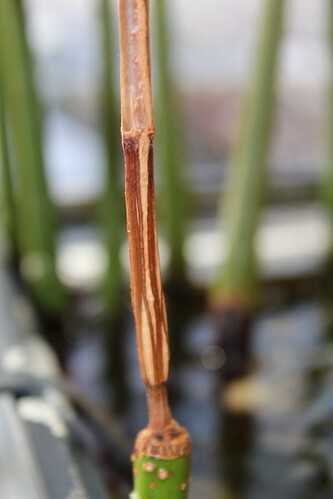 Another thing that I have noticed is that the woody part of the stems are starting to grow outward. 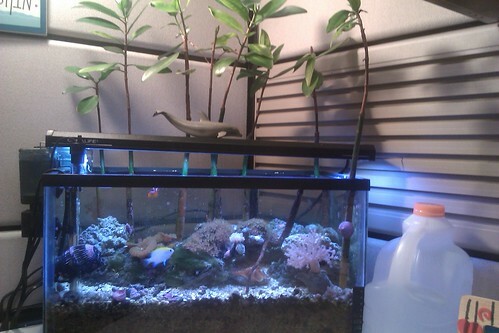 Also my tank got really low on water and covered one of the smaller mangroves in salt spray. By the time I got to it, it was too late. Growth shot of the roots. See how the stock is splitting. My guess is that the stem/trunk is growing. Death by salt spray. It is to entangled in the rockwork to remove it. 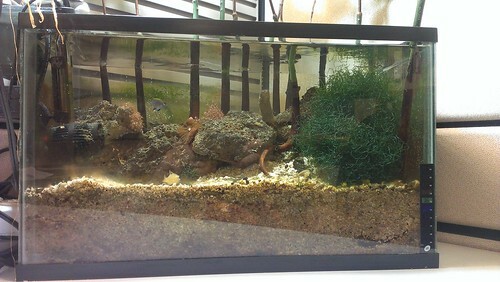 The red algae that I got for the tank is all but gone. I don't know if it was the sunlight, but it just did not do to well. Yesterday I was having an issue finding one of the fish, and I think it was stuck in the algae. When I found it today it was dead. Down to one of each cardinal. I took a new position at my work, and as a result I will be loosing my window office for a cubical. That also means I will be moving the tank a short distance. I will post pictures of the move. It has been awhile since I posted any updates. The tank has had quite a few things happen. The tank is now in its new home and has been for some time. Unfortunately all but one of the gold striped carnal fish died, so I was down to one fish for awhile. Also all of the corals did not survive, and the red algae died too. 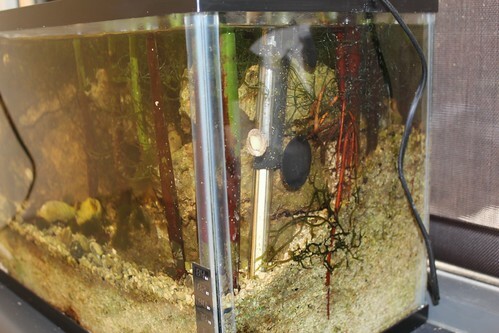 When I moved the tank I did not have the light setup on a timer, and as a result the mangroves were not getting sufficient lighting. Since then I have added a timer and things are looking much better. 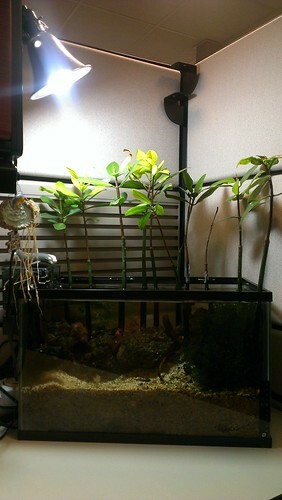 Along with that I have been doing a 1 gallon water change weekly to keep water quality in check. Since things stabilized I added in two sunshine chromises and some soft corals. I first added a kenya tree and it has been opening up fine, so I added in a mushroom and GSP. 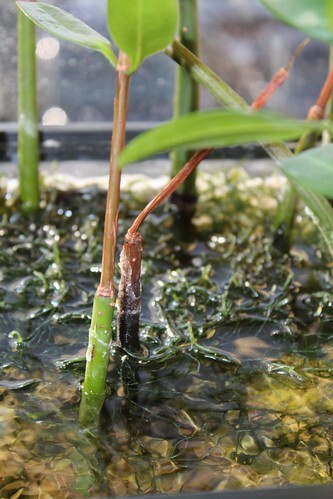 Mangroves grow much better in conditions of 80% humidity more akin to their natural environment. My guess is that the vertical splits on the trunk is growth as it appears in the 20% humidity environment of Utah. 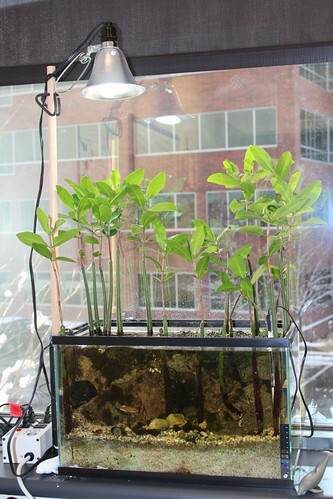 I don't know if I showed this before but here is a pic of Mangroves as they grew bushy in my enclosed sump. All this new green growth you see in this pic happened in about a year. Just thought it might be helpful to see the comparison. Thanks for the info. Since the lighting schedule things have improved. 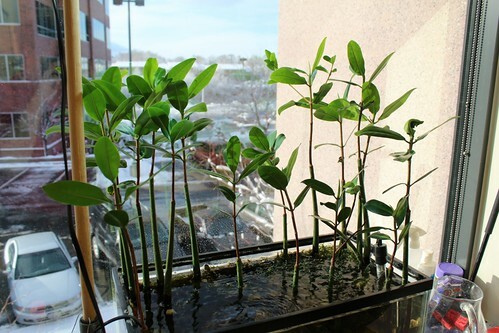 I spray the mangroves every day I am in the office, and make sure that any salt creep is removed. Since the lighting change I have seen good growth signs, but I might need to upgrade the lights. Currently I am only running one 28 watt 5k bulb, and I think I could get better results with a stronger light. I have changed a few things out to help the mangroves and I will see how well it helps. 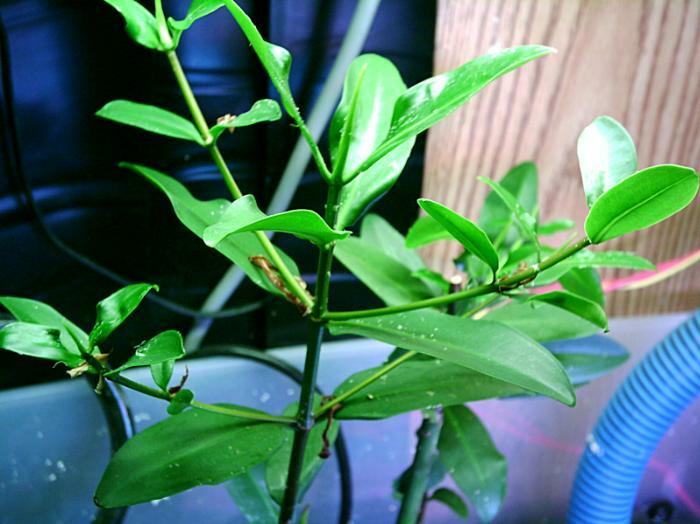 I changed the CF light to a 75W plant light, and I spray the plants several times during the day. The reason is that an office is rather low on humidity, and that is my way to combat that. 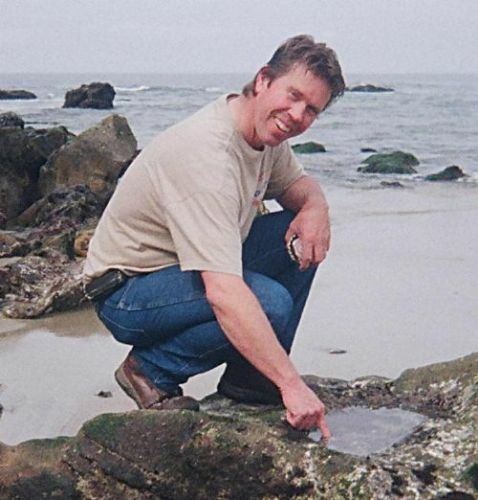 Another change I made was to start using a phosphate absorbing media along with carbon. 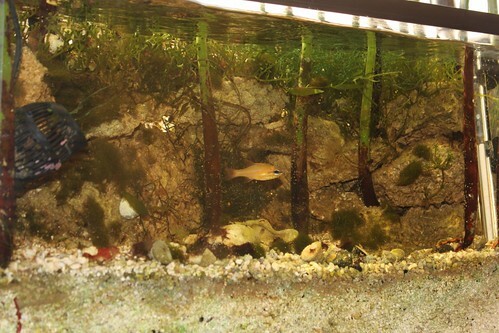 This is in a hopes that I can help get rid of the green hair algae that has found a home in a few spots. Also there has been an outbreak of green slim algae on the sand, and I hope to get that under control soon. I added some LED lights to the tank, and that has helped me keep some different corals, and it has made the previous ones much more happy. Also I have added a few things to the tank. Two weeks ago I added about 5 snails, an emerald crab, a hermit crab, red macro algae, and green mermaids cup macro. Also I now have a frog spawn, green star polyps, green mushrooms, blundel buttons, and a kenya tree. All of those are doing well. I did add a cutting from my gorgonian, but it is not doing so well. 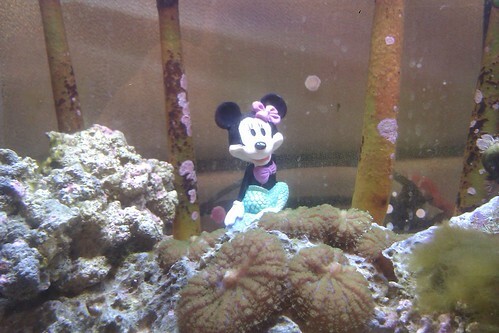 Also the sebae anemone I added a few weeks back disappeared and I can not find it, so I think it passed away. Also this week I added in a pair of clownfish. I have a new mangal system just going up now! Awesome! I can't wait to see some pictures! If you want to brough the root dip I used, let me know. Wish I would have! I'm super nervous on the transplant (already done). We'll see if they pull through. The LED lights that I was using finally died on me. They were in the water one to many times and gave up. I changed them out for a T5 setup. Since then I lost the macro algae in the tank and I have been battling some hair algae. Also I added a few other corals. Oh, on an interesting note. 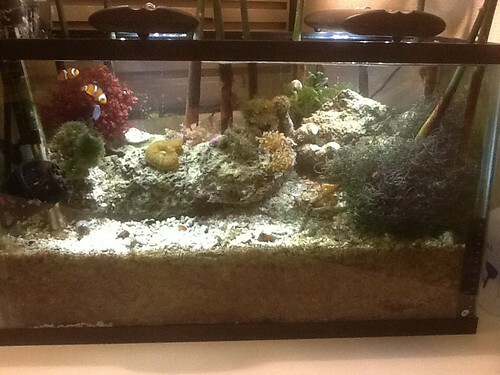 I added 4 fish, 2 clowns and 2 sunshine chromis. The clownfish disappeared, and one of the chromis. Also I added an anemone, but that also disappeared. The rumor in the office was that the cleaning crew took them since there was nothing left in the tank that would have indicated where they went. However, after being out on vacation for a week, when I came back one of the clown fish showed up. The thing that is funny about it, no one in the office claims to have added it and I have a hard time believing that after so long the fish would just show up after being missing for several weeks. Good mystery! 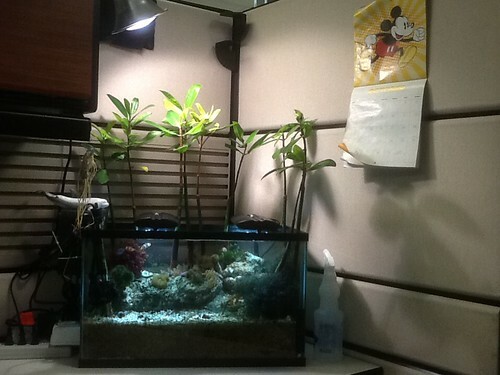 Someone in the office has been bugging me for awhile to get a mermaid in the tank. His idea was a potential HR issue, so I I found a compromise to that. Had to show my Disney side. Also I have noticed the emerald crab in the tank eating the hair algae, yea! Update: The tank had a horrible algae bloom. I suspect it was due to others in the office over feeding. I worked on solving the issue, but it really did not get any better. As a result I chose to break down the tank and bring it home for some remodeling. However, the stress of the move killed everything! Ugh! @#$%@$. Anyway, at this time the tank is no longer. However, I may at some future point start it back up again. I still really like this thread.